Sen. Tom Harkin’s ( D-Iowa) new proposal to reform No Child Left Behind is the latest attempt by policy makers to fix the country’s “dropout factories,” identified in the bill as schools with lower than a 60-percent graduation rate. 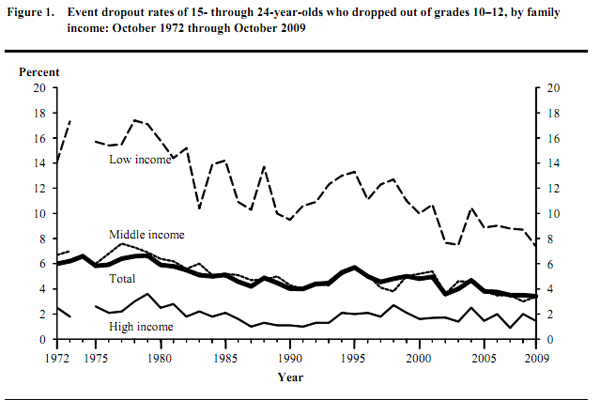 But a new report has found a silver lining amid the crisis: The number of dropouts is already on the decline. A new National Center for Education Statistics report on dropout rates has found that while there has been an overall decline in dropouts since 1972, there are still 3 million students between the ages of 16 and 24 without a high school diploma, a disproportionate number of whom are minority and poor. According to the report, the “event dropout rate,” which estimates the percentage of high school students who left school between the beginning of one school year and the beginning of the next, is five times greater for low-income teenagers than it is for those from affluent families. 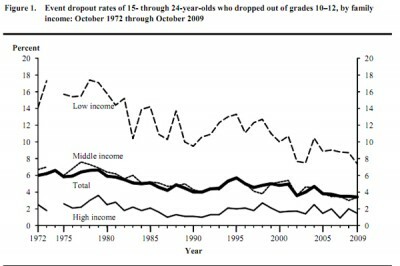 The difference in the dropout rate between white and minority teenagers also remains stark. The rate is twice as high for black teens (4.8 percent) as it is for white teens (2.4 percent). It is even higher for Hispanics, at 5.8 percent. The report also measured the “status dropout rate,” which shows the percentage of school-age youth who are not in school and who haven’t earned a diploma or alternative credential, with largely the same results. Under this measure, the difference between Hispanic and white young people was even greater. While 5.2 percent of white youth were not in school, that number was 9.3 percent for black youth and 17.6 percent for Hispanic youth.